Anyway, you join me today on my bedroom floor where I am currently convalescing. This was the dramatic conclusion of a day Chris and I spent lugging the Howlround soundsystem to and from a secret performance for the students of Havering College as part of their ‘Sonic Futures’ event. The theme this year was ‘dereliction’ – who else would they call, quite frankly?! And after a couple of hours on these floorboards, I’ve started to gain real, first-hand experience of what feeling ‘derelict’ is like. I’m completely confident, however, that by the coming of our next gig at Archaeologies, all will be back to full working order (with the exception of the wall – I’ll just blu-tak something over it and hope the landlord doesn’t notice). 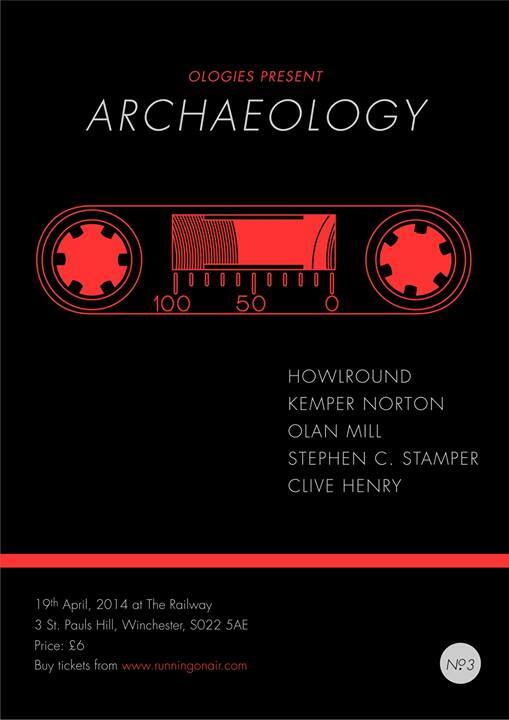 Those of you based in the vicinity of Winchester are warmly requested to The Railway, 3 St. Pauls Hill, where we’ll be playing alongside Stephen C. Stamper, Clive Henry, Olan Mill and our old friend Kemper Norton, who’s recent album Carn for Exotic Pylon is a thing of beauty indeed. Tickets and further information here. For those of you who never leave London, not even for a moment, I’m pleased to add that we shall be playing Club Bermuda at The Roxy Bar and Screen in Borough on April 25th and The Electric Dog Show, Power Lunches, Dalston on May 7th . Further details for both of these exciting performances to follow. I also implore you to read this extremely flattering review of Howlround‘s trio of official releases on the blog of ace music magazine/radio show The Sound Projector! Made our chests puff out with pride, so it did! Photo by Andy Popperwell, featuring me pulling my EXPLAINING FACE. Troublingly, it’s the most flattering of the bunch. For bonus fun, see if you can spot the fellow oldskool junglist. Answers on a postcard! In conclusion, special thanks this week must go to Andy, Alex, Dave and the students of Havering College (there’s some more photos of the event here if you fancy a gander). We’re very grateful for your interest and the new additions to the Howlround arsenal. I’m quite sure those new Revoxes will work a treat once we’ve scrubbed a decade’s worth of Andy’s garage off them!